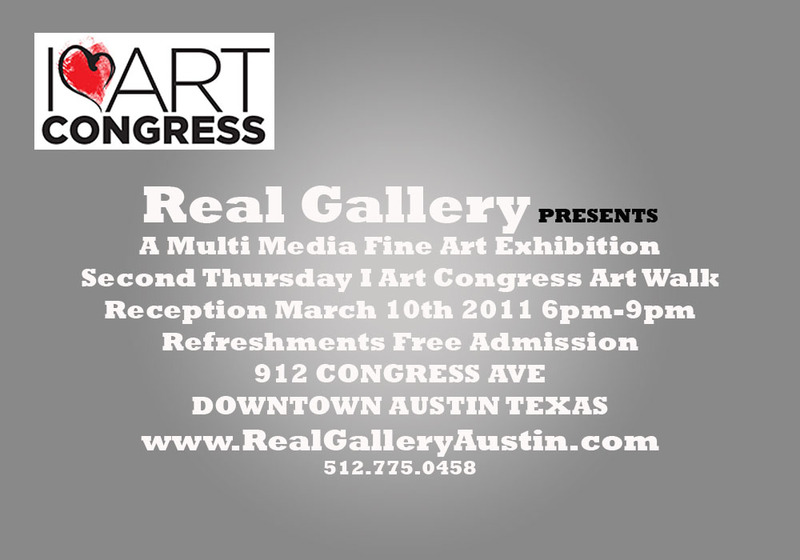 Real Gallery OUTSIDER ART Multi Media Fine Art Show & Reception March 10 6pm-9pm in the I Art Congress Second Thursday Art Walk INSIDERS AVENUE One Night Only 912 Congress Ave Downtown Austin, TX 78701 Refreshments. Free admssion. 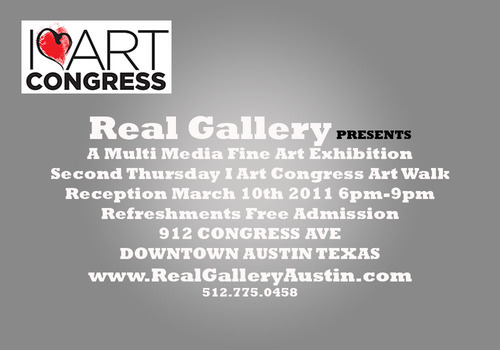 http://www.realgalleryaustin.com/ 512/775-0458 Participating artists Elena Knapp, Tina Weitz, Ann Seago, Kathi Herrin, Greta Olivas, Tatiana Nikolova Houston, Kay Hughes, Valerie Olivas, Cara Quinn, Laura Sturtz, Suzanne Stewart, Deborah Thomas, Betty Jameson, Lucian Richards, Humaira Fatema and LA based visual and voice artist Michelle Sparks. GALLERY HOURS: Tuesday and Wednesday March 8th, 9th 4pm-6pm, Thursday March 10th 3pm-9pm, Friday March 11th 4pm-6pm, Saturday March 12th 4pm-6pm. Exhibit Closes Sunday March 13th Noon-3pm.